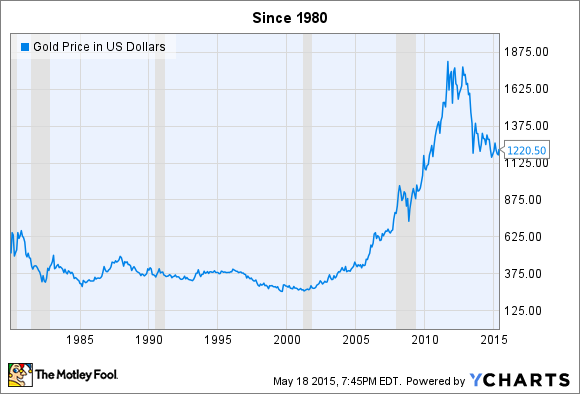 USAGX: Is This Fund for You? 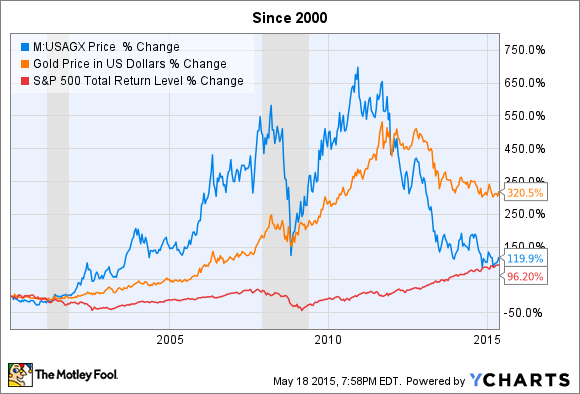 USAGX fund invests primarily in gold miners. Is this fund worth investing in? If you've considered investing in gold or precious metals, then you may have come across the USAA Precious Metals and Minerals Fund (NASDAQMUTFUND:USAGX). While not a pure-play investment in gold or silver directly, USAGX is a targeted mutual fund, holding shares in companies that mine or process precious metals, meaning the market price of precious metals is hugely important to the companies held in the fund. Let's take a closer look at the reasons you would either own gold, or the companies that produce it, as well as the USAGX fund itself. Is it worthy of your investing dollars? After peaking in the early 1980s, gold would trade below $600 per ounce for more than 20 years, and following a pattern of mostly declines until the early 2000s. And while gold went on a decade-long tear beginning during the first recession of that decade, it has lost 30% of its value since late 2011. To start, mining is an expensive undertaking, and only a handful of miners tend to consistently turn gold into profits. Second, gold demand is cyclical in nature -- a lot of gold's market value is driven by market speculators, in addition to its fundamental value for industrial and commercial uses. And since this speculation can really ramp up during times of economic uncertainty, it whipsaws the value of stocks that are highly reliant on the price of gold even more than the commodity itself. And that affects the returns of the USAGX fund, which is based on the value of its stock holdings. Second, the fund has a pretty steep expense ratio of 1.24%. According to the USAA fund facts page, it's slightly lower than the category average of 1.32%, but that will still have a measurable impact on your long-term results, since the fund manager will deduct that percentage from the fund's assets every single year, whether the value goes up or down. 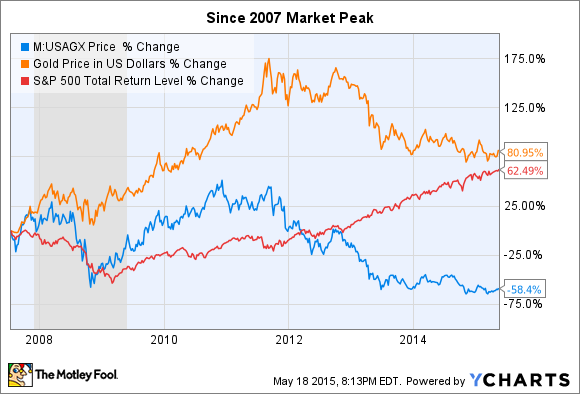 As a matter of fact, it's been a pretty poor investment since the stock market bottomed out in 2009. Precious metals are often considered more likely to hold their value in a high-inflation period, and in times of uncertainty this has been one of the big drivers behind gold's price appreciation. But when that somewhat artificial demand weakens, as has happened over the past few years on a relatively strong economic recovery in the U.S., the gold prices fall sharply. This is part of what drives the "boom or bust" nature of the gold producing industry. When demand skyrockets -- taking gold prices along for the ride -- gold producers kick production into high gear, developing resources that may not have been profitable at lower gold prices. This approach can drive profits way up in the short term, but it also pushes up fixed costs. 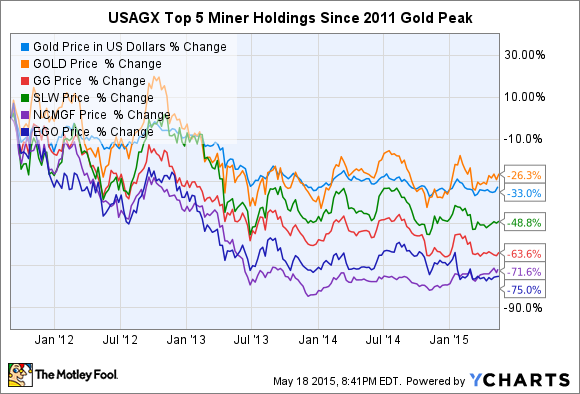 These companies are the top-five largest miners held in the USAGX fund as of March 31. 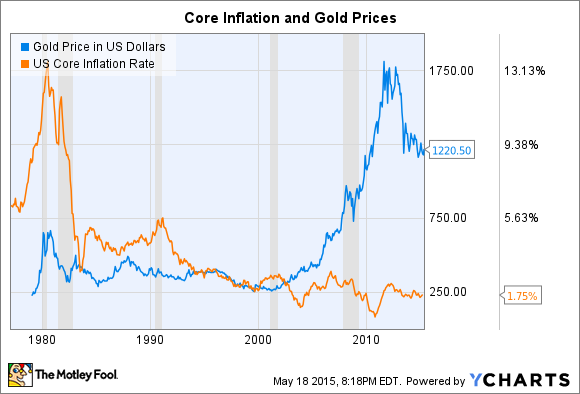 The falling price of gold over the past several years has killed them. At some point in the future, I'm relatively sure that gold will spend another period of time as a superior investment to the stock market. The problem is, there are zero reliable predictors that you can use to decide when gold is a better bet for long-term returns. While that doesn't mean it's something you should absolutely avoid in your portfolio, there's plenty of data that makes it clear that it shouldn't be your primary investment, or even make up a large percentage of your nest egg. Furthermore -- and most importantly to the subject at hand -- USAGX doesn't look like it's either a worthy proxy for gold, or really that good of a fund to invest in miners with. The reality is, the benefit the fund gets from the small handful of "good" mining companies doesn't come close to making up for the terrible performance the majority of the sector is likely to produce over time. Add in the 1.24% annual expense for the privilege of owning the fund, and there's just not very much to like. A better bet? 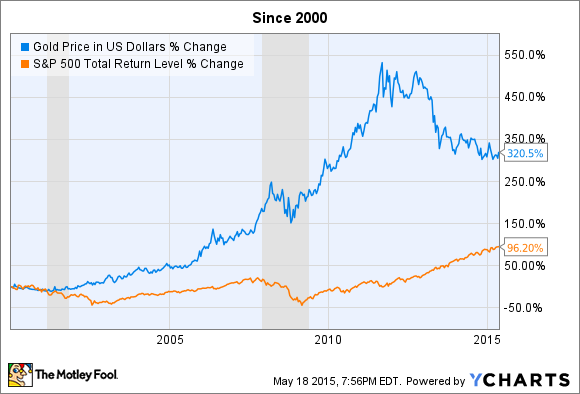 Vanguard Precious Metals and Mining Fund (NASDAQMUTFUND:VGPMX). It gives you similar exposure to gold and precious metals/minerals miners, but at a much lower cost, with an expense ratio of 0.25%.